Happy February! 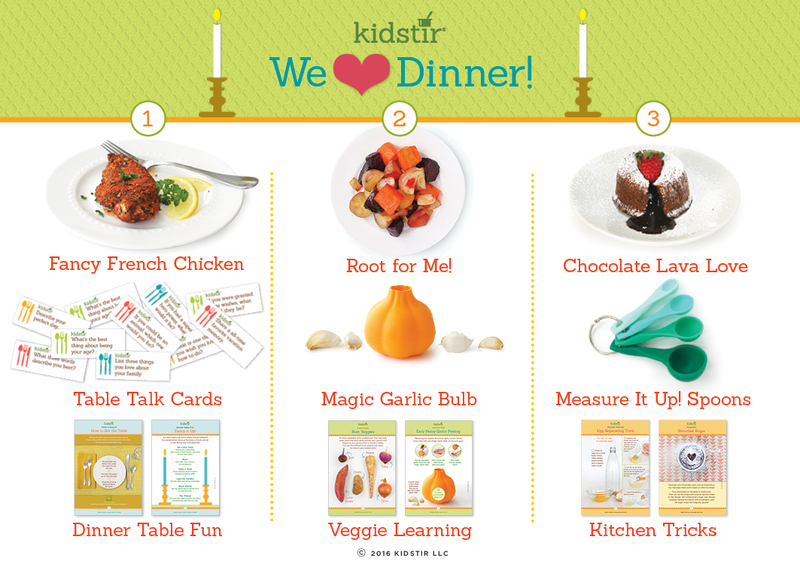 It’s the month of love and I’m so excited to introduce a beloved kit, our February We Heart Dinner Kit! I love putting a family friendly twist on Valentine’s Day and the kitchen tricks in this kit will help you (and your kids) turn an everyday meal into a grand occasion. Plus, your little chefs will gain the really important life skills of preparing and serving a full dinner from start to finish. Before you get going, read our post on Getting Kids to Help Make Dinner. Then, get cooking! Fancy French Chicken Chicken is so overworked and under appreciated, sound familiar? Ha ha. I have to admit, even I don’t always have the best attitude about ho-hum chicken. This dinner recipe is so fabulous because it is amazingly simple to make, but also super tasty and stylish. It really does help you show your kids that any meal can be extraordinary with the choice of the right flavors and technique. In this recipe we familiarize kids with the important skill of handling raw poultry, including proper hygiene and food safety. Then we introduce an amazing, versatile French herb mixture Herbes de Provence (typically comprised of savory, marjoram, rosemary, thyme, oregano and other herbs). We also teach a simple, sophisticated French cooking technique called “en papillote” where you enclose food in a pouch or bag in the oven for a moist, flavorful result. This was Julia Child’s favorite way to cook dinner and a must for any kid chef to learn! Root for Me! Best news ever! My parental brainwashing is working 🙂 For their talent show my kids and their friends are going to be performing rap song I Love Vegetables by Parry Gripp (video coming soon)! Okay I admit one of my sons refused to sing that he loved brussel sprouts on principle, but still, he was able to identify several other veggies he loved, including carrots and broccoli. Progress, people! Making veggies cool is one of the best ways to get kids on board with trying and eating them. Recipes like Root for Me! make it easy to prepare and enjoy vegetables (psst… also check out our yummy Crazy for Kale). So cook this together, and your kids will learn how to peel, cut, season, and roast vegetables for a really yummy side dish! Chocolate Lava Love Chocolate = love, right? This is the recipe of the year, hands down! We have gotten so many *sweet* notes from little chefs and their parents about this recipe, that we can’t even keep track. It’s a surprisingly easy recipe to make, but wow, is it impressive for a fancy dinner! I have made it for lots of grown ups who have been wowed. But when the kids make it, it’s a room full of oooh-la-las! In addition to baking (check out our helpful Measure Up! video tutorial here), this recipe also includes great ideas for decorating desserts, which instantly turns the outcome into something extraordinary. Here’s our Easy Heart Stencil to use long after the recipes in this kit are devoured! Measure-It-Up Spoons Every little chef needs his or her own set of measuring spoons. What a great way to instill pride, teach how to care for your belongings, and practice lots of math while having fun (he he) in the kitchen. Our beautiful colors are kid friendly and will become an instant favorite. I have a feeling the grown-ups might find themselves reaching for this set too! Magic Garlic Bulb Okay, this is the coolest, most unexpected kitchen tool that you had no idea you needed but now love and use almost daily! This garlic bulb is made of silicone- super eco friendly and malleable- in a fun color and shape. Pop fresh garlic cloves into this bulb, then press and roll it on your counter. The cloves will pop out fully peeled. Voila! Kids of all ages can use this safe and handy tool, so it’s a perfect way to get all the siblings involved. Besides the delicious recipes, there’s tons of foodie learning in this month’s kit: How to Set the Table (you can download a printable here too! ), Family Time- Fancy it Up ideas, Stovetop Safety, Root Vegetable Food Facts, Easy Peasy Garlic Peeling, Egg Separating Trick, and Stenciled Sugar Food Art. Keep on learning with our online downloadable for Napkin Folding Fun! Plus, load up on the great recipes from our DIY page and you’ll have a month full of yumminess. There’s a so-easy and tasty Pasta Caprese recipe that will make any weeknight a breeze. The kids will feel proud and can even pack their own lunch with leftovers. Little chefs who’ve learnt to cook “en papillote” can use their new skills to make this flavorful and healthy Simple Salmon. If you’ve got family members avoiding gluten or want a way to get more vegetables into your kids diet, our Cauliflower Pizza rocks on both counts. And, once your kids have made a full meal, they’ll surely want to make dinner again. Order our single Taco Truck Fun kit from our Kidstir Store and you’ll be all set for another wow experience! Happy Valentine’s Day! 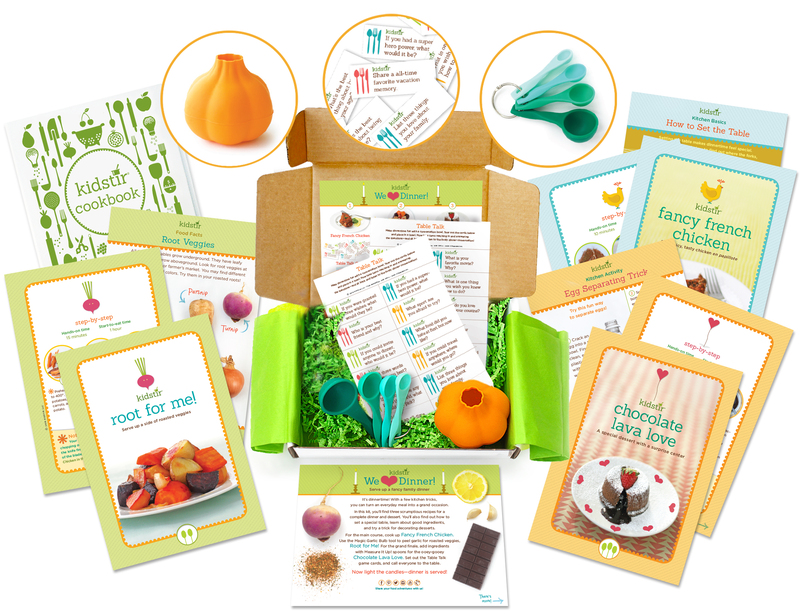 We hope the wonderful recipes in this kit keep you feeling the love all month long!